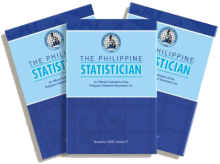 The Philippine Statistician (TPS) is a refereed scientific journal published twice a year. TPS aims to disseminate a wide range of papers of technical, theoretical, and applied statistical nature considered of general or special interest to varied groups of statisticians. The Commission of Higher Education (CHED) recognized The Philippine Statistician as one of CHED Accredited Research Journals.